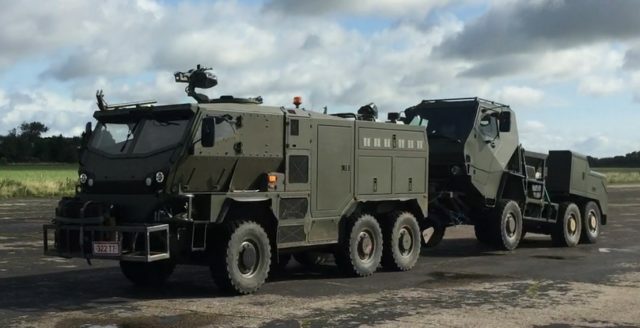 The 6×6 HMT LWR offers high levels of agility, off-road performance and protection in common with Supacat’s High Mobility Transporter (HMT) family, which includes `Jackal` and `Coyote` now within UK MoD’s Core Fleet. HMT LWR utilises many HMT design features such as the variable height air suspension system, engine and drive line that have been battle proven in numerous theatres. Blast and ballistic protection has been built into the chassis providing the optimum protection for its weight of 10.5 tonnes. The vehicle is capable of wading through up to 1.5m of salt water, with an additional 0.5m of wave splash. This enables the vehicle to be deployed from landing craft. It can operate at -30 to +50 degrees. HMT LWR utilises an innovative new Supacat designed technology, `Supalift` (patent pending), which extends the range of vehicles that can be recovered by a light weight recovery vehicle. HMT LWR’s recovery system can be operated both in conventional mode and by the operator engaging `Supalift`, which increases the maximum lifting weight of the recovery system by over 60%. In conventional mode the HMT LWR recovery system lifts a maximum recovered vehicle axle mass of 3.8 tonnes and in `Supalift` mode rises to 6.1 tonnes (specification based on recovering an HMT 400 `Jackal 2`). `Supalift` technology is based on the principle of distributing the weight of the casualty vehicle more evenly over the recovery vehicle. Phil Applegarth, Head of Supacat, said, “HMT LWR provides customers with a highly versatile and cost effective light weight recovery capability, with the flexibility to recover a wide range of vehicles. We are very proud of our engineering team in developing `Supalift`, which finally makes a light weight recovery vehicle a reality and is a game-changer in extending the lifting capability of recovery systems for defence and other industry sectors”. At last year’s DVD show Supacat revealed the concept demonstrator for the LW(AP)RC programme as one of several new variants of the HMT platform. This has since been developed as HMT LWR to full prototype, which will be displayed on Supacat’s DSEi stand N9-360. “HMT LWR also demonstrates the flexibility of the HMT platform in being configurable to different roles to meet the needs of current and future programmes”, said Phil Applegarth, Head of Supacat.